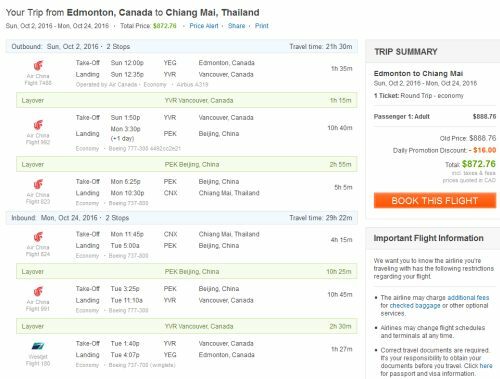 Air China has dropped the price of their flights from Edmonton to Chiang Mai, Phuket, and Bangkok, Thailand down to $872 CAD roundtrip including taxes. When it comes to Thailand, it's rare to see an amazing price on flights right to Chiang Mai or Phuket. It's generally only Edmonton-Bangkok that drops to unusually low price levels on rare occasion. May, September, October, November, and up to mid-December 2016. The late November to mid December dates are probably the most desirable in terms of weather both here and there. When traveling to Chiang Mai, some of these dates also seem to involve a one day layover in Beijing, China on the way there, which may or may not be a plus to you. Some flights are a bit longer, especially on the way back. If it has a total travel time of more than 28 hours on the way home, you may want to try a slightly different return date. There seems to be plenty of flights with a reasonable 22 hours of total travel time on the way there, especially to Phuket and Bangkok. 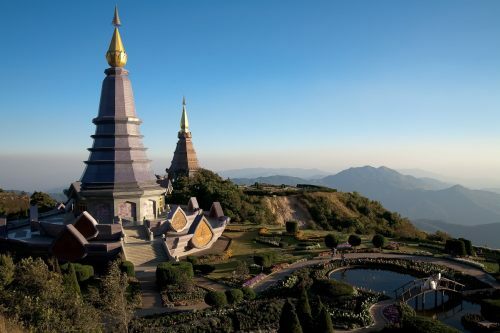 To Chiang Mai, flights without the additional one day layover in Beijing are tougher to find. edmonton, yeg, flight deals, asia, bangkok, thailand, bkk, southeast asia, air china, phuket, hkt, chiang mai and cnx.